The Frisco Employes' Magazine is a monthly publication devoted primarily to the interests of the more than 30,000 active and retired employes of the Frisco Lines. It contains stories, items of current news, personal notes about employes and their families, articles dealing with various phases of railroad work, poems, cartoons and notices regarding the service. Good clear photographs suitable for reproduction are especially desired, and will be returned only when requested. All cartoons and drawings must be in black India drawing ink. Employes are invited to write articles for the magazine. Contributions should be typewritten, on one side of the sheet only, and should be addressed to the Editor, Frisco Building, St. Louis, Mo. Distributed free among Frisco employes. To others, price 15 cents a copy; subscription rate $1.50 a year. Advertising rates will be made known upon application. CRYS'I'AL CITY, Mo., on the Frisco's river division is well named. It is, indeed, a crystal city, for just across from the Frisco station is located the largest plate glass factory west of the Alleghenies, a branch of the largest plate glass factory in the world — by name, the Pittsburgh Plate Glass Company. Daily and hourly, great sheets of glass are molded and polished and placed in the stock room. Daily this tremendous plant, covering eighty-six acres, hums with life, and an inspection of the workings of its many departments is of startling interest. Many years ago, in the thirties, a few capitalists formed a company in New Haven, Connecticut, called the "Missouri-Illinois Mineral & Land Company", and endeavored to locate and enter such mineral, agricultural and timber lands as might become valuable as the country improved. Forest Shephard, a mineralogist and geologist, was sent out to examine and locate lands in the West. He located silica or sand rock near Crystal City, which, from tests made by the Thames Plate Glass Works of England proved to be 99.4 per cent pure silica. The finding of such a large amount of this sand rock proved to he the first consideration for the establishment of this large factory in Crystal City. 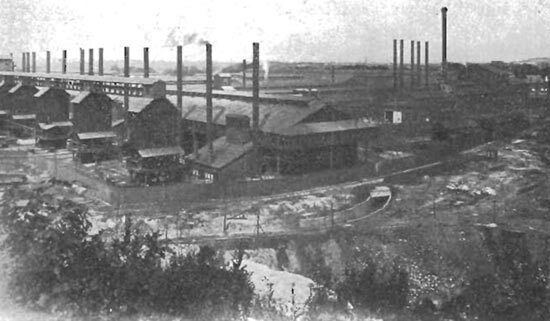 The original company, formed in Detroit, was called the American Plate Glass Company, and the Crystal City plant was not established until 1872. The Branch factory, of course received all its supplies from the Detroit firm, and wishing to find a name for. the city located on Frisco Lines, they decided upon "New Detroit". The natives, however, thought Crystal City much more appropriate, and so the little city became known by the products which this large factory produced. As a consequence of the money panic of 1873, the glass works had to succumb, and the property was sold to a new organization called the Crystal Plate Glass Company. In 1895 that company was absorbed by the Pittsburgh Plate Glass Company, which plant has grown until today it is acknowledged the largest plate glass company in the world. The making of plate glass remains one of the very difficult arts. Many chemical problems attend the melting of every batch of raw material, composed of glass at one time, and of supporting a sustained temperature of from 2,500 to 3.000 degrees Fahrenheit through nearly one day and a night. In making the pots, the selected clay is ground, screened and mixed accurately with certain constituents, then kneaded. much as a baker kneads dough. Handwork is then necessary because a slight defect, even a small air cavity would cause the pot to crack in the furnace. The pot maker builds up the pot laboriously, making rolls of clay with his hands and forming the great receptacle, layer by layer, with infinite care. When finished,. the pot must be stored from six months to a year for "seasoning", and even then it is tested before it is placed in service. There are twenty huge furnaces in the furnace room, each holding twelve pots. The batch of raw materials is placed in the pot and the pots are placed side by side, twelve to a furnace, and the work of melting begins. Experts maintain close watch over the condition of each one. With long iron testing rods they draw out small quantities as samples. Three different times materials are added to each pot during the twenty-four hours each pot is in the furnace. When at last the heating is completed,. an electric crane clasps the hot pot with a pair of mammoth tongs and lifts it through the door of the furnace. Workmen stand ready with long implements to skim the top of the molten glass, swiftly removing any slag or impurities. 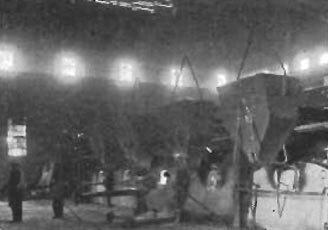 Another crane swings the pot over the casting table, a great steel slab of 200 tons in weight, thirty-two feet long by twenty feet wide. An ingenious device tilts the pot and pours its contents so that it flows the full width of the table. A steel roller, weighing twenty-five tons, advances and rolls the molten mass flat, the thickness of which is determined by gauges. Both table and roller are water cooled to prevent warping under the great heat. and when the roller has completed its work, the mass which only a few moments before was a white hot fluid, lies on the steel table a red hot sheet of glass, in area about the size of the table and half an inch in thickness. The glass must now proceed, without delay, to the annealing oven — some 800 feet long. An electric installation carries the glass plate through it very slowly — so slowly in fact, that it requires five hours to traverse the 800 feet. During this slow progress, the plate passes under gradually reduced temperatures, minutely controlled. When it finally reaches the end, it has become cool enough to handle and has acquired the requisite toughness. It is then examined for defects and cut accordingly. Thus a large piece of glass may, through defects, be reduced to a dozen pieces of various sizes. The next operation is the grinding and polishing which is done on tables weighing scventy tons each, which tables are on wheels and may be moved from one place to another. The pieces of glass are placed on the table in plaster of Paris casts, then towed by motor car to a place beneath the grinders. The machines that rotate the tables cover an area of fifty square feet, measure morc than fifty feet from base to top and require motors of 500 H.P. to drive them. The massive iron runners that revolve over the surface of the glass to grind it, have an additional combined weight of 124,000 pounds. As the table revolves, water and sand — first coarse, then finer sand — are fed under the runners, which are lowered slowly, until the entire weight rests on the glass. The surface in this manner is ground with absolute uniformity and all irregularities are worn away. When the grinding is finished and the surface washed, the tables are moved to the polishing machine. where red oxide of iron, commonly known as rouge, finest of all abrasives, is fed under the revolving runners, which, in the polishing process arc buffing disks of felt, eighteen inches in diameter. The glass then takes on the brilliant polish of plate glass. It is completely finished on both sides before it is broken from its cast, after which it is washed and is then ready for cutting. Its original thickness when it went to the grinders was about half an inch. Now, after these various operations of grinding and polishing, it has been reduced one-half. It is now ready to be cut into pieces of any dimension. There was in store stock one large piece of plate glass measuring 151 x 258 inches, one-fourth inch thick and weighing approximately 816 pounds. This large size plate glass retails for from $200.00 to $1,000.00 and more. Tiers of glass suitable for windshields were also in stock, the price of which averages around $4.00. The Union Electric Company furnishes all the power for running the machinery and lights of this enormous plant. A recently added department of this glass company is its framed mirror department. Mirrors are made, mounted, bevelled and decorated in beautiful cut designs of flowers and leaves, ready for shipment to cities to be sold at retail. Interior views of the glass plant. 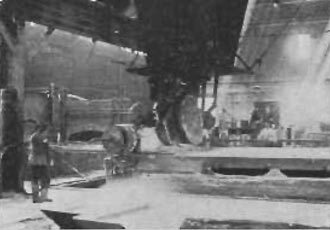 Below, polishing room, showing huge table in left foreground, which revolves to polish the glass by use of water and sand. Pot being emptied onto table. Note roller ready to immediately roll the molten mass into sheets of glass. That, as briefly as can be told, is the story of the making of glass. But the Pittsburgh Plate Glass Company practically has "made" Crystal City. As the inhabitants of that city are mostly plate glass workers, this company has established what is known as the Crystal City Library Association. It is a large three-story building, the first floor of which is given over to bowling, billiards, pool and a soda fountain; the second floor holds the library, with its 5,000 books of fiction and volumes of educational works and engineering subjects, the mayor's office, city parlors and the library manager's office. The third floor is for motion pictures and a dance hall. The operations are conducted under the direction of the manager, and with no desire to make any profit, but simply to provide amusement and recreation for the community. The affairs of the institution are administered by a board of directors, as well as representative citizens of the community. It was through the courtesy of G. W. Oakes, plant manager, that departments of this wonderful plant were visited by a representative of the Magazine, and through the kindness of Fred Butler, local traffic manager, that the early history was secured. Mr. Butler works closely with W. H. Poggemeier, Frisco agent, in shipping from this enormous plant, the finished products of glass which are consigned, via Frisco rails, to points all over the United States, and to Manila, Japan, Guatemala and Havana. He is most complimentary in his praise of Frisco handling of the products of this plant. Crystal City and the glass plant mean much to the Frisco, and the Frisco, in turn, takes the products of this plant to the far ends of the world.